Sadly, Summer has passed and Autumn is here. Nevertheless, as the leaves fall our work to help greyhounds continues. 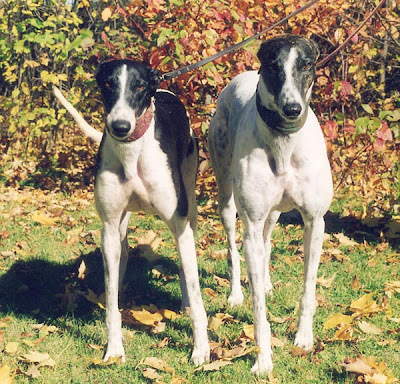 To end this October week, here are a few greyhound news treats. Yet another former dog track is starting a new life. In Wisconsin, a local school board has voted to purchase the former St. Croix Meadows Dog Track and turn it into a school. This wonderful news proves yet again that the end of dog racing is not only good for greyhounds, but can also be in the long-term interests of the local community. Obviously, I am disappointed by the election of Governor Earl Ray Tomblin in West Virgina, who won by a narrow margin of 50% to 47%. Greyhound breeders are celebrating his victory, which ensures that their multi-million dollar subsidies will continue for the time being. One thing is certain, though: the debate over greyhound racing in West Virginia is only just beginning. Today, an Australian greyhound trainer proved once again that the racing industry is out of touch with mainstream humane values. Speaking to the Daily Advertiser newspaper, trainer Susan Burgess said that she recently bought two greyhounds as part of a "two-for-the-price-of-one" deal. In reporting on the deal, the newspaper noted that "bargain hunting is not just confined to market stalls or shopping malls." In the United Kingdom, a greyhound came in last in every race before it was discovered he is blind. This is a sad story that will hopefully have a happy end. Jack Sprat is an absolutely adorable dog, and is now looking for a loving home. Please consider taking a moment to vote for greyhound adoption advocate Dennis Tyler as a People Magazine Reader's Choice Hero. 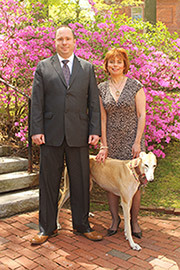 Dennis and his wife Claire are both tremendous advocates for greyhounds, and if he wins People will make a $10,000 donation to support greyhound adoption. Have a great weekend, and enjoy Autumn. Before long, Winter will be here!